Zero-valent iron particles at the nanoscale are proposed to be one of the important reductants of Cr(VI), transforming the same into nontoxic Cr(III). In this study zero valent iron nanoparticles(ZVINs) were synthesized and characterized for hexavalent chromium removal from aqueous solutions. Five different zero-valent iron nanoparticle types comprising of bare and stabilized ZVINs with poly acrylamide(PAM), polyvinyl pyrrolidone(PVP), polystyrene sulfonate(PSS) and guar gum(GG) were synthesized and employed in this study. The sizes of zero-valent iron nanoparticles were found to be 40, 14, 17, 29 and 34nm, using transmission electron microscopy (TEM), corresponding to bare zero valent iron nanoparticles(ZVINs), poly acrylamide(PAM), guar gum(GG), poly styrene solfunate(PSS) and polyvinyl pyrrolidone(PVP) stabilized zero valent iron nanoparticles (ZVINs) respectively. The trend in the sizes of ZVINs with various stabilizers in the decreasing order was found to be bare ZVIN > PVP-ZVIN >PSS-ZVIN> GG-ZVIN> PAM-ZVIN respectively. Results showed that by increasing hexavalent chromium concentrations from 20 to 100 mg/L, the Cr(VI) efficiency removal decreased significantly. When the ZVINs concentrations increased from 2 to 10 gr/L(0.1 to 0.5g per 50 mL), the Cr(VI) removal efficiency enhanced. The most effective treatments of ZVINs and Cr(VI) for hexavalent chromium removal from solutions were 10 gr/lit (0.5g per 50 mL) and 20 mg/L respectively, so the efficiency of bare and polymer stabilized-ZVINs on Cr(VI) removal from solutions was found to be in the following order: bare ZVINs < PVP-ZVINs <PSS-ZVINs< GG-ZVINs< PAM-ZVINs. However, in the absence of a stabilizing agent, NZVI particles exhibit a strong tendency to agglomerate into larger ones, due to the high surface energy and the intrinsic magnetic interaction, which causes the reduction of reactivity in application condition. Furthermore, the remaining NZVI in the treatment zone makes the technology uneconomical and even generates secondary iron pollution [9,10]. To prevent ZVIN aggregation and attachment to the sand grains, surface modification of nanoparticles, among all proposed methods, is definitely an advantageous approach that creates electrostatic repulsive and steric forces which act against interparticle attraction forces and its attachment to porous media. Till now, there have been lots of polyelectrolytes (e.g. carboxymethyl cellulose (CMC) , polyacrylic acid (PAA) [17,18], polyvinylpyrrolidone [21,22], green polymers (e.g. Guar gum [24,25] and starch ), and surfactants (e.g. sodium dodecylbenzene sulfonate (SDBS), which have generally been employed as stabilizers showing reasonable performances. The aims of this research were: (1) the synthesis of bare and stabilized ZVINs with Polyacrylamide(PAM), Polyvinylpyrrolidone(PVP), Polystyrene sulfonate(PSS) and Guar gum(GG) and their characterization, (2) the reductive removal of Cr(VI) using 4-stabilized ZVINs and non-stabilized ZVIN in aqueous solutions under different experimental conditions such as ZVIN concentration, initial Cr(VI) concentration, (3) compare the effectiveness of Cr(VI) reduction by different type of Fe0 particles, (4) determination of optimum time and pH for Cr(VI) removal with stabilized and non-stabilized ZVINs in aqueous solutions. In this research, chemicals used to synthesize iron nanoparticles included Poly acrylamide(PAM), Polyvinyl pyrrolidone(PVP), Polystyrene sulfonate(PSS) and Guar gum(GG) were purchased from Sigma Aldrich Co., ferrous sulfate heptahydrate (FeSO4·7H2O) was prepared from AppliChem Co., Moreover, sodium borohydride (NaBH4), potassium dichromate (K2Cr2O7), acetone, sodium hydroxide (NaOH), concentrated hydrochloric acid (12 N HCl), sodium chloride (NaCl), sodium dithionate, hydrogen peroxide, and 1,5 diphenylcarbazide were purchased from Merck Co. To prepare chromium solution, a specific amount of potassium dichromate was poured in a particular fraction of distilled water and kept at 4°C. High-purity water was used to prepare the solutions. Water was always deoxygenated prior to reaction by bubbling nitrogen gas for 1 h. All reactions were carried out under an inert nitrogen atmosphere using a Schlenk line, at room temperature (22 oC). All chemicals used were analytical reagent grade. The formed Fe0 nanoparticles were observed to be highly stable for a longer period when compared to unstabilized Fe0. After observing black precipitated particles in suspension, a strong magnet was applied to separate particles from the suspension. The filtered particles were washed with deionized water and acetone sequentially and were vacuum dried in a desiccator for 24 h.
The morphology and size of bare and stabilized- ZVIN were evaluated using scanning electron microscope (SEM) (Hitachi S 4160 model, Japan) and LEO-906E transmission electron microscope (TEM) (operated at 200 kV), respectively. For SEM images, A Hitachi S4160 scanning electron microscope coupled to a Noran System Six EDS operated at low vacuum under 20 kV was used. A small amount of non-metalized sample was placed in the vessel and introduced into the microscope. For TEM images The samples were prepared by depositing two droplets of a diluted water suspension of nanoparticles onto a carbon coated 400 mesh copper grid. Excess solvent was absorbed with a filter paper and the grids were dried in a vacuum desiccator. The entire process was carried out under nitrogen to avoid oxidation of ZVIN. Diameter sizes of ZVIN were measured manually using the measuring tool of an image software. The mean diameters were estimated by counting at least 50 particles. zeta potential measurements were carried out with a ZetaPlus zeta-potential analyzer from Brookhaven Instruments Corporation. The measurements were carried out with a suspension containing approximately 5 mg of NZVI in 100 mL of 1 mM NaCl, at room temperature. Averaged values were obtained from ten measurements and are expressed along with the standard deviation. Infrared spectra of dried samples were recorded on a Spectrum BX Perkin Elmer instrument equipped with a diamond crystal ATR accessory and a DTGS detector. Furthermore, the elemental composition of synthesized particles was determined using energy dispersive X-ray spectroscopy (EDS) technique. 1. 2,4,6,8, and 10 g/L of each nanoparticles was added to plastic bottles containing 50 mg/L of Cr(VI) solution (0.1,0.2,0.3,0.4 and 0.5g of each nanoparticles in bottles containing 50 mg/L of Cr(VI) solution). 2. 2g/L (0.1 g per 50cc solution) of each nanoparticles was added to plastic bottles containing 20,40,60,80 and 100 mg/L of Cr(VI) solution in 3 replications. The pH of solutions was adjusted to optimum values using 0.1 M HCl and 0.1 M NaOH for each bare and polymer-ZVINs and the bottles were shaken using rotary shaker at 150 rpm at the equilibrium contact times. Moreover, to obtain the optimum pH of Cr(VI) removal from solutions, 50 mL of 50 mg/L chromium solution with different pH values ranging from 2 to 10 (2,2.2,2.4,2.6,2.8,3,3.2,3.4,3.6,3.8,4,5,6,7,10) and 2 g/L( 0.1 g per 50 mL solution) of bare and polymer-ZVINs were added to 15 sets of bottles with mentioned pH values. To evaluate the equilibrium contact times of Cr(VI) removal from aqueous solutions, 50 mL of chromium solution with the Cr(VI) concentration of 50 mg/L was added to the bottles at the times of 1,2,3,4,5,6,7,8,9,10,30,60,100,120 minutes and the pH values were adjusted to the values from prior section tests. Then 2 g/L( 0.1 g per 50 mL solution) of bare and polymer-ZVINs were added to current bottles with mentioned time intervals. At the end of each experiment, the reacted polymer-ZVINs was separated by means of a strong magnet and the solutions were centrifuged at 5000 rpm for 5 min[19,20,22]. where C0 and C are the initial and final concentrations of Cr(VI) (mg/L) in solutions, respectively. In Fig. 2, TEM photographs of ZVINs are given. The particles are spherical and nearly monodisperse. SEM photographs are shown in Fig 1. From the TEM results, the average size of the particles was found to be 40, 14, 17, 29 and 34nm for bare ZVINs, poly acrylamide(PAM), guar gum(GG), poly styrene solfunate(PSS) and polyvinyl pyrrolidone(PVP) stabilized ZVINs respectively. The trend in the sizes of ZVINs with various stabilizers in the decreasing order was found to be bare ZVIN > PVP-ZVIN >PSS-ZVIN> GG-ZVIN> PAM-ZVIN. When the interaction between the stabilizer and the metal nanoparticle is more, agglomeration of the particles will be less resulting in smaller sized particles. The SEM image obtained for the coated ZVINs shows separate particles in comparison to SEM images obtained for the non-coated particles. It can be assumed that the sonification led to the breakage of the agglomerates and that the subsequent coating prevented re-agglomeration . Fig. 1. (a, b, c, d and e sections) shows the SEM images of bare and polymer-stabilized zero-valent iron nanoparticles. SEM image of dried bare and PAM, GG, PSS and PVP stabilized-ZVINs showed that these nanoparticles were nearly spherical especially in Fig. 1 (a, b and c sections). Fig. 1(d and e sections) revealed less spherical shapes due to nanoparticle agglomeration and magnetic forces between particles. However, the TEM image of bare and PAM, GG, PSS and PVP stabilized-ZVINs (Fig. 2, a, b, c, d, and e sections) revealed that these nanoparticles had a core-shell structure. The shell probably resulted from iron oxide, while the core was attributed to Fe0 which is so clear in related TEM images. The aggregated structure of ZVINs was attributed to the magnetic forces and van der Waals forces between Fe particles. Also, these images, especially in d and e sections, have been shown that the coating layer of polymers has been attached to the surfaces of ZVINs. As was shownin Table 1 bare synthesized ZVINs had more than 99.5 percent of iron which showed that the purity of synthesized nanoparticles was so high and the percentage of other elements was not significant. zeta potential is the potential difference between the dispersion medium and the stationary layer of fluid attached to the dispersed particle. The zeta potential is a key indicator of the stability of colloidal dispersions. The magnitude of the zeta potential indicates the degree of electrostatic repulsion between adjacent, similarly charged particles in a dispersion. For molecules and particles that are small enough, a high zeta potential will confer stability, i.e., the solution or dispersion will resist aggregation. When the potential is small, attractive forces may exceed this repulsion and the dispersion may break and flocculate. So, colloids with high zeta potential (negative or positive) are electrically stabilized while colloids with low zeta potentials tend to coagulate or flocculate as outlined in the Table 2. . The results of the current study showed that among the synthesized polymer stabilized ZVINs, bare and PAM- stabilized ZVINs had the lowest and highest stability respectively which has been illustrated in Table 3. As was shown in Table 3. PAM- stabilized ZVINs and bare ZVINs had the highest and lowest zeta potential values (-54.8, -1.48 mV) which according to Table 2. as an index for stability, were from Good stability and unstable ZVIN groups. Therefore the stability of bare and polymer stabilized ZVINs was found to be in the following order: bare ZVIN< PVP-ZVIN<PSS-ZVIN< GG-ZVIN< PAM-ZVIN which according to Table 2. were from unstable, low, moderate, good and good stability groups respectively. five Fe0 nanoparticles concentrations were employed in this study. Figs. 3-7 shows that the increase of Fe0 concentration greatly enhanced the Cr(VI) removal efficiency. When the ZVINs concentrations increase from 2 to 10 g/L (0.1 to 0.5g per 50 mL), the Cr(VI) removal efficiency will be increased and it’s values was 56.36, 65.33, 71.40, 82.56 and 89.70 by percent for bare ZVIN, PVP-ZVIN, PSS-ZVIN, GG-ZVIN and PAM-ZVIN respectively. The most effective treatment of ZVINs and Cr(VI) were 10 g/L (0.5g per 50 mL) and 20 mg/L respectively, so the efficiency of bare and polymer stabilized-ZVINs on Cr(VI) removal was found to be in the following order which has been shown in Figs. 3-7: bare ZVIN < PVP-ZVIN <PSS-ZVIN< GG-ZVIN< PAM-ZVIN . bare ZVIN < PVP-ZVIN <PSS-ZVIN< GG-ZVIN< PAM-ZVIN . Table 4 has shown the study results of another scientist for hexavalent chromium removal from aqueous solutions. As was indicated in current Table the most effective treatments for reduction of Cr(VI) are pH, the initial concentration of Cr(VI) and initial dosage of nanoparticles. The results of the present study were in agreement with the results of mentioned studies in Table 4. As it was indicated in Fig. 13, among five polymers stabilized ZVINs, poly acrylamide(PAM) stabilized ZVINs were the most effective on Cr(VI) removal from solutions and the Cr(VI) removal efficiency was found in the following order: bare ZVIN < PVP-ZVIN <PSS-ZVIN< GG-ZVIN< PAM-ZVIN. Results showed that by using PAM, GG, PSS, PVP stabilized ZVINs and bare ZVINs the mean values of Cr(VI) removal from solutions were about 87.77, 79.78, 69.21, 62.94 and 54.24 by percent respectively. As was shown in Fig 12-13, the optimum times for Cr(VI) removal from solutions were 2, 3, 5, 6 and 8 minutes for polyacrylamide(PAM), Guar gum(GG), polystyrene sulfunate(PSS) , polyvinyl pyrrolidone(PVP) stabilized zero-valent iron nanoparticles and non stabilized zero-valent iron nanoparticles(ZVINs) respectively, so the removal reaction of Cr(VI) from solutions is so rapid, especially in the first 10 minutes. The optimum pH values for Cr(VI) removal from solutions were 3, 2.8, 2.4, 2.2 and 2 for polyacrylamide(PAM), guar gum (GG), polystyrene sulfunate(PSS) , polyvinyl pyrrolidone(PVP) stabilized zero-valent iron nanoparticles and non stabilized zero-valent iron nanoparticles(ZVINs) respectively. According to the mechanism of Cr(VI) removal on the ZVINs, the adsorption process that is induced by electrostatic, hydrophobic and hydrogen bond interactions mainly depends on the solution pH. Furthermore, pH affects the surface charge of ZVINs.When pH is under the pH of zero point charge (pHzpc), the positive surface charge makes it easier to adsorb the negative Cr(VI). On the contrary, it will produce electrostatic repulsion, resulting in low removal efficiency. During the reduction process, the effect of pH can be clearly expressed by the following Eqs. (6–9). A lot of H+ is consumed all along the reaction. This explained why an acidic environment is preferred by the Cr(VI) removal in aqueous solution. In addition, the hydrophobic and hydrogen bond interactions increased as pH decreased, which further enhanced the removal efficiency of Cr(VI) . As was indicated in current results, the efficiency of bare and polymer stabilized-ZVINs for reduction of hexavalent chromium and its removal from aqueous solutions was found to be in the following order: ZVIN < PVP-ZVIN <PSS-ZVIN< GG-ZVIN< PAM-ZVIN. According to these results, the most effective polymer stabilized-ZVINs for Cr(VI) removal in aqueous solutions were PAM stabilized-ZVINs and afterward GG-ZVIN, PSS-ZVIN, PVP-ZVIN, and bare ZVIN respectively. In other words, PAM stabilized-ZVINs had the highest power of reduction for reducing of Cr(VI), which probably was due to less sedimentation, agglomeration, and oxidation of them, and then GG-ZVIN, PSS-ZVIN, PVP-ZVIN, and bare ZVIN must be arranged respectively. Among the synthesized polymer stabilized-ZVINs, PAM stabilized-ZVINs produced more H+ ions than the other ones, because of their more reducing power for Cr(VI) reduction in aqueous solutions. As was described above, when PAM stabilized-ZVINs will be oxidized in solution, more H+ ions will be produced and then these H+ ions should be consumed in the reduction procedure of Cr(VI), so the H+ concentration will be decreased and it would be caused to solution pH values increased[12,37]. Therefore this argument shows that why the optimum solution pH values for the PAM stabilized-ZVINs is the highest of all(equal to 3 in this research). In this study bare ZVINs had the lowest optimum solution pH values(equal to 2 in this research) among the other nanoparticles which is explained below: According to results of this research, bare ZVINs had the lowest reducing potential for reduction and elimination of Cr(VI) which is due to more sedimentation, agglomeration, and oxidation of them and this causes to H+ ions be less consumed in the aqueous solutions, so this results in higher H+ ions concentration and lower solution pH values than the other ones. In order to hexavalent chromium removal from solutions, stabilized-ZNINs need less time than the bare ones. Polymer stabilized-ZVINs have a polymer coated layer around, which prevents these nanoparticles from oxidation, agglomeration, and sedimentation. So the efficiency of Cr(VI) reduction will be increased and the needed contact time for its removal should be shorter. In this study among the synthesized Polymer stabilized-ZVINs, PAM stabilized-ZVINs had the most reducing ability and stability which is perhaps due to less oxidation, agglomeration, and sedimentation of them, so the needed contact time for hexavalent chromium removal from solutions would be the shortest of all(2 minutes in this research) and then GG-ZVIN(3 minutes), PSS-ZVIN(5 minutes), PVP-ZVIN(6 minutes), and bare ZVIN(8 minutes) should be arranged according to their stability and reduce potential respectively. As was shown in current study results, the longest contact time for removal of Cr(VI) belongs to bare ZVINs (8 minutes in this research) because of their highest ability of oxidation, agglomeration, and sedimentation. In the present study results showed that the most effective synthesized Polymer stabilized-ZVINs for reduction of hexavalent chromium from aqueous solutions was PAM stabilized-ZVINs. Results showed that by using PAM, GG, PSS, PVP stabilized ZVINs and bare ZVINs the mean values of Cr(VI) removal from solutions were about 87.77, 79.78, 69.21, 62.94 and 54.24 by percent respectively. So the removal ability of synthesized Polymer stabilized-ZVINs was found to be in the following order: bare ZVIN < PVP-ZVIN <PSS-ZVIN< GG-ZVIN< PAM-ZVIN. The most effective treatment of Cr(VI) and ZVINs in hexavalent chromium removal procedure were 20 mg/L and 10g/L (0.5 g per 50 ml solution) respectively. When the dosage of Cr(VI) and ZVINs increased the efficiency of Cr(VI) reduction, decreased and increased respectively. As was indicated in current study results, when PAM stabilized-ZVINs will be oxidized in solution, more H+ ions will be produced and then these H+ ions should be consumed in the reduction procedure of Cr(VI) and it would be caused by optimum pH values increased(equal to 3 for PAM stabilized-ZVINs). In this study, bare ZVINs had the lowest optimum solution pH values(equal to 2 for bare ZVINs) for reduction of Cr(VI) among the other nanoparticles. Among the synthesized Polymer stabilized-ZVINs, PAM stabilized-ZVINs had the shortest contact time(2 minutes) for removal of Cr(VI) from solutions. As was shown in current study results, the longest contact time for removal of Cr(VI) belongs to bare ZVINs and then GG-ZVIN(3 minutes), PSS-ZVIN(5 minutes), PVP-ZVIN(6 minutes), and bare ZVIN(8 minutes) should be arranged according to their stability and reduce potential respectively. 1. Babaei AA, Baboli Z, Ahmadi M, Jaafarzadeh N, Goudarzi G, Mostufi A. Removal of Cr (VI) from aqueous solutions by nano-sized magnetite modified with SDS. BPUMS. 2015;18(5):944-59. 2. Reddy AB, Jaafar J, Majid ZA, Aris A, Umar K, Talib J, et al. RELATIVE EFFICIENCY COMPARISON OF CARBOXYMETHYL CELLULOSE (CMC) STABILIZED Fe 0 AND Fe 0/Ag NANOPARTICLES FOR RAPID DEGRADATION OF CHLORPYRIFOS IN AQUEOUS SOLUTIONS. Digest Journal of Nanomaterials & Biostructures (DJNB). 2015;10(2):331-40. 3. Biswas P, Wu C-Y. Nanoparticles and the Environment. J AIR WASTE MANAGE. 2005;55(6):708-46. 4. Huang S-H, Chen D-H. Rapid removal of heavy metal cations and anions from aqueous solutions by an amino-functionalized magnetic nano-adsorbent. J Hazard Mater. 2009;163(1):174-9. 5. Chen S-S, Hsu H-D, Li C-W. A new method to produce nanoscale iron for nitrate removal. J Nanopart Res. 2004;6(6):639-47. 6. Christian P, Von der Kammer F, Baalousha M, Hofmann T. Nanoparticles: structure, properties, preparation and behaviour in environmental media. ECOTOXICOLOGY. 2008;17(5):326-43. 7. Cirtiu CM, Raychoudhury T, Ghoshal S, Moores A. Systematic comparison of the size, surface characteristics and colloidal stability of zero valent iron nanoparticles pre- and post-grafted with common polymers. Colloids Surf, A. 2011;390(1):95-104. 8. Cook SM. Assessing the use and application of zero-valent iron nanoparticle technology for remediation at contaminated sites. Jackson State University. 2009. 9. Darlington TK, Neigh AM, Spencer MT, Guyen OTN, Oldenburg SJ. Nanoparticle characteristics affecting environmental fate and transport through soil. Environ Toxicol Chem. 2009;28(6):1191-9. 10. Fabbricino M, Gallo R. Chromium removal from tannery wastewater using ground shrimp shells. Desalin Water Treat. 2010;23(1-3):194-8. 11. 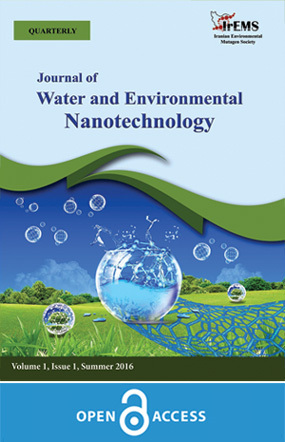 Fu F, Han W, Huang C, Tang B, Hu M. Removal of Cr(VI) from wastewater by supported nanoscale zero-valent iron on granular activated carbon. Desalin Water Treat. 2013;51(13-15):2680-6. 12. Geng B, Jin Z, Li T, Qi X. Kinetics of hexavalent chromium removal from water by chitosan-Fe0 nanoparticles. CHEMOSPHERE. 2009;75(6):825-30. 13. Greenwood R, Kendall K. Selection of Suitable Dispersants for Aqueous Suspensions of Zirconia and Titania Powders using Acoustophoresis. J Eur Ceram Soc. 1999;19(4):479-88. 14. Handy RD, von der Kammer F, Lead JR, Hassellöv M, Owen R, Crane M. The ecotoxicology and chemistry of manufactured nanoparticles. ECOTOXICOLOGY. 2008;17(4):287-314. 15. He F, Zhao D. Preparation and Characterization of a New Class of Starch-Stabilized Bimetallic Nanoparticles for Degradation of Chlorinated Hydrocarbons in Water. Environ Sci Technol. 2005;39(9):3314-20. 16. He F, Zhang M, Qian T, Zhao D. Transport of carboxymethyl cellulose stabilized iron nanoparticles in porous media: Column experiments and modeling. J Colloid Interface Sci. 2009;334(1):96-102. 17. Kanmani P, Aravind J, Preston D. Remediation of chromium contaminants using bacteria. Int J Environ Sci Technol. 2012;9(1):183-93. 18. Kumarathilaka P, Jayaweera V, Wijesekara H, Kottegoda IRM, Rosa SRD, Vithanage M. Insights into Starch Coated Nanozero Valent Iron-Graphene Composite for Cr(VI) Removal from Aqueous Medium. Journal of Nanomaterials. 2016;2016:10. 19. Liu T, Lo IMC. Influences of Humic Acid on Cr(VI) Removal by Zero-Valent Iron From Groundwater with Various Constituents: Implication for Long-Term PRB Performance. Water Air Soil Pollut. 2011;216(1):473-83. 20. Lin Y-H, Tseng H-H, Wey M-Y, Lin M-D. Characteristics of two types of stabilized nano zero-valent iron and transport in porous media. Sci Total Environ. 2010;408(10):2260-7. 21. Madhavi V, Prasad TNVKV, Reddy BR, Reddy AVB, Gajulapalle M. Conjunctive effect of CMC–zero-valent iron nanoparticles and FYM in the remediation of chromium-contaminated soils. Applied Nanoscience. 2014;4(4):477-84. 22. Mystrioti C, Xenidis A, Papassiopi N. Reduction of hexavalent chromium with polyphenol-coated nano zero-valent iron: column studies. Desalin Water Treat. 2015;56(5):1162-70. 23. Mukherjee R, Kumar R, Sinha A, Lama Y, Saha AK. A review on synthesis, characterization, and applications of nano zero valent iron (nZVI) for environmental remediation. CRIT REV ENV SCI TEC. 2016;46(5):443-66. 24. Qiu X, Fang Z, Yan X, Gu F, Jiang F. Emergency remediation of simulated chromium (VI)-polluted river by nanoscale zero-valent iron: Laboratory study and numerical simulation. CHEM ENG J. 2012;193(Supplement C):358-65. 25. Rahmani A, Norozi R, Samadi MT, Afkhami A. Hexavalent Chromium Removal from Rqueous Solution by Produced Iron Nanoparticles. ijhe. 2009;1(2):67-74. 26. Ramazanpour Esfahani A, Hojati S, Azimi A, Farzadian M, Khataee A. Enhanced hexavalent chromium removal from aqueous solution using a sepiolite-stabilized zero-valent iron nanocomposite: Impact of operational parameters and artificial neural network modeling. J Taiwan Inst Chem Eng. 2015;49(Supplement C):172-82. 27. Ramazanpour Esfahani A, Farrokhian Firouzi A. Synthesis and application of stabilized zero-valent iron nanoparticles for hexavalent chromium removal in saturated sand columns: experimental and modeling studies. Desalin Water Treat. 2016;57(33):15424-34. 28. Esfahani AR, Hojati S, Azimi A, Alidokht L, Khataee A, Farzadian M. Reductive removal of hexavalent chromium from aqueous solution using sepiolite-stabilized zero-valent iron nanoparticles: Process optimization and kinetic studies. Korean J Chem Eng. 2014;31(4):630-8. 29. Shao-feng N, Yong L, Xin-hua X, Zhang-hua L. Removal of hexavalent chromium from aqueous solution by iron nanoparticles. Journal of Zhejiang University Science B. 2005;6(10):1022-7. 30. Siciliano A. Removal of Cr(VI) from Water Using a New Reactive Material: Magnesium Oxide Supported Nanoscale Zero-Valent Iron. Materials. 2016;9(8). 31. Singh R, Misra V, Singh RP. Synthesis, characterization and role of zero-valent iron nanoparticle in removal of hexavalent chromium from chromium-spiked soil. J Nanopart Res. 2011;13(9):4063-73. 32. Santos FSd, Lago FR, Yokoyama L, Fonseca FV. Synthesis and characterization of zero-valent iron nanoparticles supported on SBA-15. J Mater Res Technol. 2017;6(2):178-83. 33. Sukopová M, Matysíková J, Škorvan O, Holba M. Application of iron nanoparticles for industrial wastewater treatment. Nanocon 2013; Brno, Czech Republic, EU2013. p. 456-60. 34. Gueye MT, Di Palma L, Allahverdeyeva G, Bavasso I, Petrucci E, Stoller M, et al. The influence of heavy metals and organic matter on hexavalent chromium reduction by nano zero valent iron in soil. Chemical Engineering Transactions. 47: Italian Association of Chemical Engineering-AIDIC; 2016. p. 289-94. 35. Tiraferri A, Chen KL, Sethi R, Elimelech M. Reduced aggregation and sedimentation of zero-valent iron nanoparticles in the presence of guar gum. J Colloid Interface Sci. 2008;324(1):71-9. 36. Tiraferri A, Sethi R. Enhanced transport of zerovalent iron nanoparticles in saturated porous media by guar gum. J Nanopart Res. 2008;11(3):635. 37. Xiong K, Gao Y, Zhou L, Zhang X. Zero-valent iron particles embedded on the mesoporous silica–carbon for chromium (VI) removal from aqueous solution. J Nanopart Res. 2016;18(9):267.